Happy Thanksgiving Y'all! Hope you are enjoying this beautiful day with family and friends! A Husband who understands my quirks, takes care of me, puts up with me and helps me follow my dreams. A tribe of people who I am absolutely crazy about! Find your tribe and love them hard! New adventures and a new day each morning to find joy in the little moments. Kiddos in my life who remind of the wonders in the world and help bring out my own inner kid! Family! Through the ups and downs, when they drive us crazy or go crazy with us, they are there! Ultimate Love through Jesus and the Grace that means I get to be part of His story! I am so very THANKFUL for all of them. Crystal River is super quaint. It actually reminded me a lot of the sweet little fishing towns you see in a Nicholas Sparks movie. It was quiet and picturesque, but there was also a whole lot to do. This is the perfect destination for anyone who loves to adventure and be on the water! Crystal Isles RV Resort is so far our favorite of all the Encore/ Thousand Trails spots we have stayed. Crystal Isles is set back in the woods, just the way I like it! Almost every spot is either on the water or has water visibility. The resort sits right on a canal just off the main channel of the river. It was quiet, beautiful and had great amenities. Our favorite? The pontoon boats they had that could be rented, either by the half or full day. We got there later in the afternoon on Friday and spent the evening boating up and down the river right up until the sun set. It was a beautiful way to get a first glimpse of what Crystal River had to offer! It was a really nice feature for the park to have, especially since pretty much everyone staying there had a boat. I would have been quiet envious seeing people motoring out, so having an option for those who don't own a boat was great. We also really liked that this park seemed to consist of a majority of fellow road travelers like us. There were a few seasonal setups or longer stay residents, but most people seemed to be traveling from elsewhere. RVs (and lots of boats) kept rolling on in. Crystal Isles is really a great place for fishers or boaters! It has quiet a number of spots where you can put your boat in and leave it docked right off your campsite for the length of your stay. Great from those who don't want to have to put in and take out everyday. Other great perks included a pool and hot tub, great clubhouse with games and darts, big outdoor chess board, horse shoes, volleyball and a set of swings. Don't have an RV? We also saw a set of tent campers, plus they have a row of cabins that you can rent. With not a lot of super close state park options if you want to stay in the heart of Crystal River, this spot was the perfect medium. In my opinion it actually had a very state park feel to it, in the fact that it was set back in the woods, while also being conveniently located to restaurants and grocery stores for stocking up on essentials (about 5+ minute drive). Overall, this was a great spot and we plan to be back! Oh, you guys! Let me tell you! Crystal River is a nature lovers dream! Our main mission for this trip was to meet some manatees, but we found so much more to love too! ~Befriending Manatees~ This was definitely the highlight of the trip for me! I have dreamed of swimming with sea cows for as long as I can remember. This trip let me check it off the bucket list! Crystal River is the only place (apparently in the world) where it is still legal to be in the water with manatees. We went to Manatee Tour and Dive and they were wonderful. They were so knowledgeable about the manatees and you can tell they really care about what they do. You can not touch the manatees (though they can and may touch you), despite what pictures will show when you google Crystal River and manatee swimming. While I was really hoping to get to touch one when they explained how to passively observe the manatees, and why it is important, you could hear how seriously they take conservation and I really respect that. So, we were given wetsuits, snorkel gear and a noodle, loaded the boat and off we went in search for sea cows! Our guide, Bryan, was great at finding all the best spots and at showing us how to get in and stay alongside the manatees. Though there weren't a lot right now due to the late winter (oh, Florida! ), we got to see a handful of grown manatees and one super cute manatee calf, whom I dubbed Carl! And I saw a stingray too! Word of warning: It is cold! But you get used to it pretty quickly. We were in and out of the water for about two hours, sometimes in for over 30 minutes, and while you aren't really swimming, more like floating (you aren't supposed to kick your legs), you can get a little tired, so I would recommend bringing water to stay hydrated and make sure you eat a good sized breakfast if you go. ** If you plan ahead, you can also get some pretty good Manatee Tour Deals on Groupon! ~Crystal River Archaeological State Park~ We hadn't planned to go here. I had actually stumbled across it while googling hiking in Crystal River and decided not to go because it really wasn't a hike. However, we actually saw it while we were out on the boat (right at the entrance to the canal for Crystal Isles) and it looked pretty neat so we docked in a little slip there on the grounds and got out to explore. I am really glad we did! There was a very interesting history behind the place. It was a ceremonial/ burial site for Native American and there are assumed to be between 3,000 and 5,000 bodies buried on site. There is a museum you can go to and then you take the walk to all of the sites, including a tall mound that you walk up. Though we didn't stay for it, the park ranger was setting up for a night walk they were going to be doing later that evening. They do them once a month and walk you around and tell you the history of the grounds. Definitely a great place to learn about true Florida history. ~Drive Fort Island Trail~ We did this later in the afternoon on Saturday. 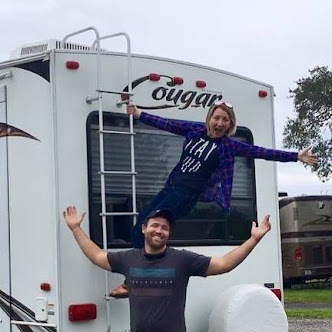 After going back to rest for a bit after the manatee swim (plus waiting for the rain to stop), we got in the car and drove the length of the road that our RV park sat on. It's a great drive with a lot of great places to get out and explore. There are two great hiking spots that I never found when I was googling places to hike. They are part of the Great Florida Birding Trail and one of them (the second spot as you're heading towards the Gulf) was one of my favorite hikes we have ever done. It is an out and back through beautiful marsh land. The trail as a little wet from the rain, but I love the added adventure of trying to keep my feet dry! We hiked it as the sun was going down, which added to the beauty, but also kept us from making our way all the way to the end so I can't wait to do it again. Fort Island Trail dead ends at Fort Island Gulf Beach. It's a great little spot for getting some sun and also has a public boat ramp and fishing pier, plus a fun little boardwalk hike between the pier and the beach. I would definitely recommend taking the drive, even if you don't plan to hike far. It was a beautiful drive and we saw very few other drivers so you really feel like you are on a back road out in the middle of nowhere. Food, glorious food! A lot of my love for a place can be determined on the eating options, which I think is what sealed the deal on making Crystal River one of my favorite new spots. ~Cracker's~ I love spots on the water! Crystal River has a few options, but we chose Cracker's based on the fact that they had oysters. A lot of times, river dining can be great and others the view is what is bringing people and not the food. This place was great, because I would come for both! I got the grilled oysters and they came shucked and ready and they were delightful. Babe got a grouper sandwich and said that the fish was really well cooked and tasted great! The only downside for me would be the birds and squirrels. They were a little too peoplized and since they both freak me out it was not so comforting. However, it was quite the show to watch one of the waitresses try to scare them off with water guns. I actually think I may have seen one of the squirrels stop and try to catch it in his mouth for a drink. Ok, so that's an exaggeration, but still. ~Copp Winery~ Oh this place was my absolute favorite! It is a cute little wine and beer brewery. It is very deceiving from outside, because it looks so small and quaint (quaint is a big Crystal River word for me apparently) that you wouldn't think they would have room to brew. But brew they do! And it is delightful. Babe really liked his flight options and I (not being a beer girl) loved that they had wine too. And sweet wine!! I had a wine named after a manatee! They also had some really good food options. We opted for the cheese plate and enjoyed it immensely. They even had a homemade mozzeralla that was delicious! Though we didn't stay for dinner, they did have some sandwich options if you were looking for a bigger meal. There is also a really cool secret feature, but I won't spoil the surprise in case you go! The prices were super reasonable too, which was just icing on the cake! And though we didn't eat there, we stopped in for a cup of coffee at the Highland House and oooo, yum!! I got a caramel latte that reached right to my soul! Babe got a coffee and together our bill didn't reach what I hit on one drink at Starbucks. Can't beat that! Overall I loved pretty much every minute of this trip and if you have ever thought about visiting Crystal River I fully believe you should! Like yesterday! We can't wait to go back and try our hands at scalloping when the season rolls around! *We used Groupons and camping discounts for a portion of this trip, but all opinions are completely ours. ~Being on the Road~ Being on the road with Babe is the perfect breath of fresh air for me. The road, the radio and my favorite guy is a perfect combination! I am thankful for the time to talk if we want to, but I am also thankful that we are really good at just being quite together. Or if I am being honest here, thankful that he is satisfied to be quite and not complain while I sing my heart out to Blue Bandana. He may call me weird, but he loves me in spite because of it (something else I'm thankful for!) The open road and no time commitments are peace for my soul! ~Food!~ Oh gosh, am I ever glad for food! And I am very thankful that Babe knows the true way to my heart is through my stomach. He knows me well. I had literally been sitting in the passenger seat on our way out of town and I was daydreaming about some 4Rivers brisket, but I thought “you know, nope. I am not going to say it. We are going somewhere new, we can try somewhere new. Ok, but really if he just decides to pull off and go, then I will love him forever and give him a kiss.” And then not only 2 minutes later he looks at me and asks, “4Rivers?” Thankful for a man who knows me well! And for beef brisket sandwiches!! He got his kiss! ~Adventure~ I am thankful for the ability to adventure and explore! I am thankful that we are able to get away and find a new place to lay our heads for the weekend! And I am super thankful for manatees and the chance to swim with them! ~Scenery~ This world is a beautiful place! I am thankful that God is creative and that He gave us so much beauty all around us. 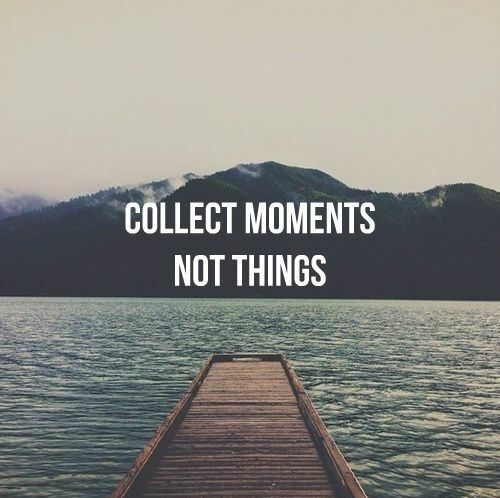 And I am thankful that it is all free to take in. A sunset costs nothing except the time spent enjoying it, which in and of itself isn’t even a cost at all but really an added blessing! ~Flo~ I am thankful for FloRida and that she is finally back on the road! When we got her we said we would try to go somewhere new once a month, even if it was just to the local county park. Just to give us time away together. Time to unplug and pour into the quiet and the slow. Well, she missed that goal last month, so I am extra thankful for this trip! It’s her 3rd big expedition and she is just as thankful as I am! Well, we are almost there, so I’m off to explore and befriend a sea cow! Have a thanks filled weekend!! What are 5 things you are thankful for right at this moment? 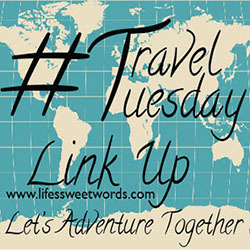 Because my thirst for adventure needs to be quenched and I am so excited that this weekend we are finally hitting the road again after being "docked" for a while today's post is some of my favorite travel words of lately! Or an RV, same concept, so I'm rolling with it (literally)... even if it is only for the weekend! 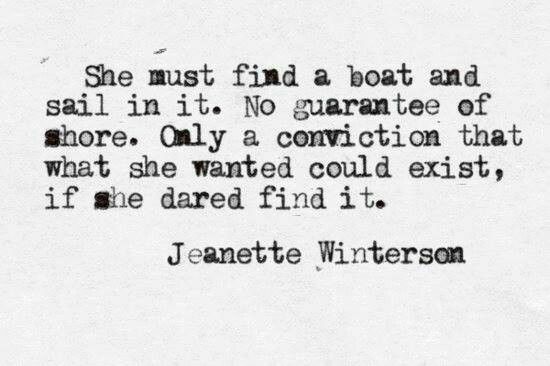 Oh this quote sets my heart a flutter and makes me dream of big, big things! Reading: I am currently in between the choosing of two books; I just started reading Charles Martin's newest book Water from my Heart, but given that my reading time ability has been lacking lately I feel I should probably start our next book club book, Where'd You Go, Bernadette. Listening- to the hum of background noises in the house, but wishing it was the voice of Dr. Mindy Lahiri. You guys, I have a new obsession and it is The Mindy Project. I have been binge watching like crazy and trying (without much luck) to pull myself away so that it lasts longer (and also so that I make time to do the whole adulting thing and ya' know work and clean and stuff). 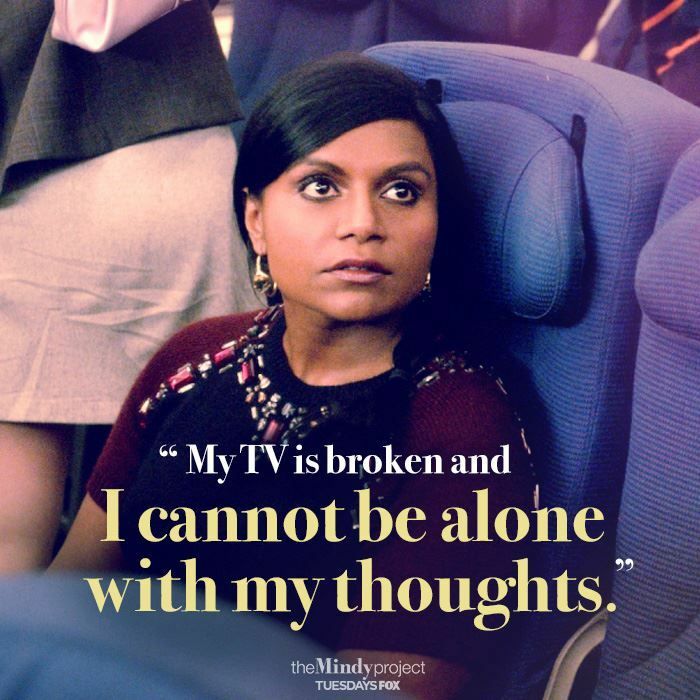 The Mindy Project may just be my spirit animal show! Thinking- That I really want to go and watch Mindy right now, "I will not. I will resist!" oh who am I kidding!? Smelling- My freshly poured coffee! There was coffee in the pot when I woke up and I forgot to pour myself a cup, nothing like remembering it at 11:30. Yay for mid-morning pick me ups! Wishing- That is was Friday! We are finally bound for Crystal River this weekend after our last attempted FLoRida trip got postponed due to poor planning and sickness. It has been over a month and a half since Flo has gotten to stretch her wheels and she is itching to hit the road! Hoping- That the little pumpkin seeds I planted, after making my pumpkin seeds the other day, actually grow into pumpkins for next Fall. They are already starting to sprout so here's to hoping the actually bloom!! Wearing- my PJs!! Amen for PJ Mondays! Loving- That cooler weather has FINALLY decided to make it's way to Orlando again! Hopefully it is here to stay this time?! Wanting- To load up Flo and hit the road right now!! Needing- More motivation this morning to actually be productive! I can do it, I can, I can!! Pumpkin seeds! Pumpkin seeds! Pumpkin seeds!! 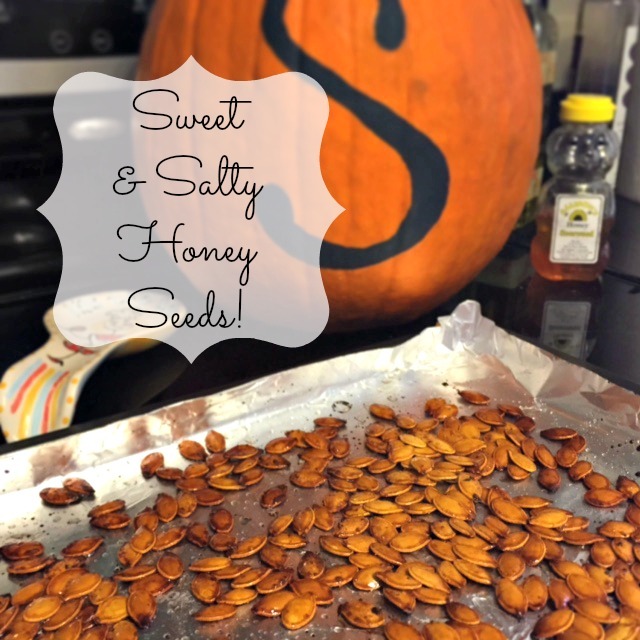 Sweet and Salty Honey Seeds! As if I could have done anything else right?! As a lover of all things honey, these are the perfect seeds for my soul! And they are super easy too! Just three ingredients and a little over 30 minutes between prep and bake and you have yourself a tasty snack! Step 1) Start by preheating the oven to 350 degrees. Step 2) Open and scoop out the pumpkin. I cut the top so that I take a large chunk out of the back. It leaves more room for me to scoop without getting overly yucky while still leaving the front nice and pretty so that I can put the lid back on and pumpkin back outside once finished. I then place all the seeds in a metal bowl of semi-warm water. I let the seeds soak for a minute or two and swoosh them around the get the stringy pulp separated. The pulp should settle to the bottom and then I fish the clean seeds out and place them on a paper towel.I like my seeds to be cleaned (no thick pulp), but not too clean (still a little orange film) because I think it add more of that pumpkin seed yumminess when finished. Step 3) I pat the seeds dry with a paper towel. I will usually do this twice, transferring the seeds from the first paper towel to a second in between patting (that way the seeds aren't sitting on a wet paper towel). The new paper towel will help to soak up some of the extra moisture, but I don't ever wait for the seeds to dry. I know some people will tell you that's a thing (and that you must wait), but I am too impatient to have that be one of my things, so they are still moist when I stick them onto their baking sheet (this method hasn't failed me yet). I prep the baking sheet with aluminum foil and a sprinkle of olive oil (makes cleanup a cinch). Step 4) Place the seeds in a plastic bag and pour in just a tad of olive oil, quiet a good squeeze of honey and about two shakes of garlic salt. I close the bag and get to shaking. I shake (and knead) until all the seeds are coated, check to make sure I feel they are evenly coated (if not, or I just feel in the mood for more, I will add a dash more salt and honey) and then spread them evenly onto a foil lined baking sheet. *Note: You could mix in a bowl, I just find the bag helps to spread the honey and salt evenly and makes cleanup a lot easier! Step 5) After making sure they are evenly spread (not a lot of seeds overlapping) I will sprinkle more garlic salt on top so that the seeds have an even coating of salt. Then for good measure, I squeeze just a bit more honey to give it a good pop and then place the pan in the oven. Step 6) Bake for 12 minutes and then take the pan out and flip the seeds. Pop back in oven for another 12-15 minutes or until golden brown (or crisped to your preference). Babe prefers his seeds a little more crispy so sometimes I will leave them in a little longer for him. Just watch carefully, they can go from brown to burnt real quick! Step 7) Voila! Just let cool and enjoy!! How seeds look coming out! Pumpkin seeds are one of my favorite fall snacks! How do you prepare yours? Any other sweet and salty recipes I should try? It's November people! As if being 6 days in meant you were just in the know. November is looking pretty exciting (and still very hot in Florida) around these parts! 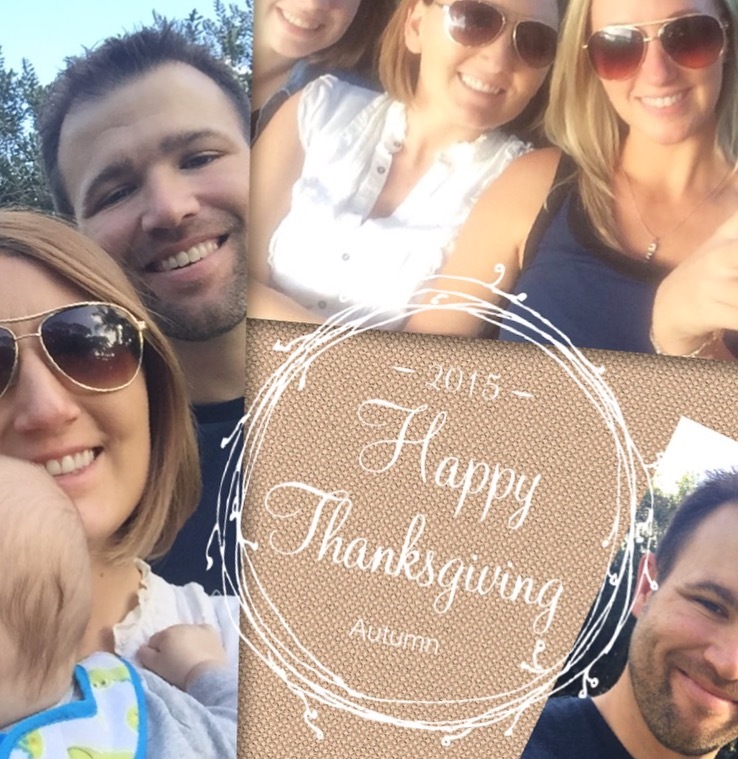 Linking up for November Currently with Jenna and Anne and for a little 5 of Friday fun! Join me? ~COOKING~ Well considering I don't "cook" a whole lot of anything these days, I figured I'd fudge a little and go with something I prepared instead. Mixing cream cheese and mayo can totally count as cooking right?! Sure! Anyways, it was my turn to host a monthly book club I am in and we try to theme our food based off of things in the book. Luckily, I picked an easy one, The Sugar Queen by Sarah Addison Allen. In honor of the main character, Josey, I baked a treats! Cupcakes and brownies, which meant licking clean the batter bowls = YUM! Josey's mom, Margaret, frequented going to tea, hence tea sandwiches. For these I used one 8oz. package of cream cheese (softened), 1/3 cup mayo, a good sprinkle of garlic salt and some fresh dill. I mixed the cream cheese and mayo together and then added the seasoning. I used the lid to the garlic salt to made bread rounds out of a slice of sandwich bread (usually 3 rounds per slice). I then spread the mixture on top of the bread and topped that with tomato or cucumber. Then I cut a little more fresh dill to sprinkle on top. Quick, easy and delicious!! ~PLANNING~ Flo's next adventure!! She hasn't been out of the driveway in a while and she is very sad about it! So because we has been cooped up for so long she has a lot of adventures coming her way in the next few months. We are doing two mini Florida adventures in November, but Flo is most excited about her big out of state adventure right after Christmas!! We are headed to Savannah and couldn't be more excited! I haven't been since I was in 6th grade and Babe and Flo have both been NEVER! Alright Savannah lovers, dish please! What do was have to see and where do we have to dine?! ~SMELLING~ Coffee sitting in the pot, filling the house with it's gloriousness!! ~APPRECIATING~ Happy mail instead of scary movie moments!! So Babe was out of town and my bestie and I were having one of our "no-more-adulting, lay-on-the-floor" moments. We had literally made it through my front door and sprawled ourselves across the rug right at the entry to the house. We were scrolling through Pinterest, reading each other quotes (come on ladies, you know those moments). It is also noteworthy to mention that it was pitch black dark out... when the doorbell rang!! We both looked at each other like, "say, what?!" Babe was gone, we were together, who in the world could be at the door? So I get up and look at out the peephole. Oh, wait! It's nobody! Nobody is there!! It's two days after Halloween, we've all seen the movies. I love scary movies! So, I know you are all thinking, this girl sure ain't going to be dumb enough to open the door! Oh contraire! I did! However, our entry has a long walkway, with no ability to access the door from the sides, so I figured I would have enough time to peek out and then slam the door shut if necessary. But in fact it was just a little package of happiness, literally happiness, sitting right at my doorstep!! How would you answer those? And don't those answers just make you want to smile?! Mine did! I would definitely recommend grabbing a copy and adding an extra dash of happiness to your days! ~ANTICIPATING~ Swimming with sea cows!! So, while I am pretty stoked about our big Savannah trip, we actually have an upcoming Florida adventure just around the corner. In two weeks we are Flo bound for Crystal River to swim with manatees! And I can't wait!! Yay!! I will hug them and love them and they will be my friends! And that's my November currently! What are you up to this month?! I just recently finished reading The School for Good and Evil series by Soman Chainani. If you have not heard of this series, you should check it out. I loved it!! It is the perfect series for girls who are trying to figure out that balance between friendship, relationships and being true to who they really are. Really, the same could be said for all of us, because it's also a great book for any woman still trying to figure that all out (12, 17, 25, 31... doesn't matter). If you love a different spin on fairy tales (characters like Lancelot, Cinderella, Peter Pan...) and don't shy a way from a little dark adventure then you really need to read this! I started it after a recommendation from a 10 year old and I couldn't recommend it more (books really can span generations)! It also just so happens that it is being turned into a movie, so you should probably jump on the train before it comes out. "What is it about a name that gives us a story to believe in?" "I'd sheltered him from his own weaknesses, and because of it those weaknesses won. I had to let you write your own story..."
"Stories go wrong when people think that their own happiness is bigger than anyone else's." - I don't know what it is for me about the word story, but in my opinion it is such a powerful word. We each have a story, one that is ours alone, but one that can be shared with others. Hundreds upon thousands of stories overlapping each other, each story adding something to another. And it is in the sharing of our stories with others that we grow a bond that transcends time, distance and differences. It's our stories that bring us together in someway or another. "Because as long as her story was about her she resisted her fate, as if living for herself was too much responsibility. But the moment she saw her fate was bigger than her, she finally felt free to embrace it." What parts of your story do you need to embrace? What parts of your story, if shared, could help set both you and others free?